The Trump administration announced on Wednesday it plans to withdraw from an organization aimed at tackling international postal issues, saying the existing agreements put U.S. businesses at a disadvantage. The administration planned to deliver its “letter of denunciation” to formally convey its intention to leave the Universal Postal Union on Wednesday, a senior White House official said. The UPU traces back to an international treaty from 1874 and now exists as an agency within the United Nations. The announcement follows a presidential memorandum Trump issued in August in which the president said other nations were unfairly receiving cheaper rates when sending small packages into the United States than postal customers shipping domestically. Trump directed the U.S. contingency at a UPU meeting last month in Ethiopia—an interagency group led by the State Department—to negotiate a fairer pricing structure, but White House officials said there was little progress toward that goal. The withdrawal announcement kicks off a year-long process, and officials were hopeful they can negotiate a new system in the interim before the administration finalizes its departure from the international group. The announcement comes as the Trump administration is engaging in a trade dispute with China, and senior officials said the current system mostly benefits China, as well as Singapore and a few European countries such as France and Germany. Those countries receive a 40-70 percent discount on packages weighing 4.4 pounds or less, officials said. The White House is seeking authority to set its own rates to ensure the Postal Service is able to cover its costs and that American businesses are not put at a disadvantage. Currently, the UPU sets “terminal dues” as the rates that foreign mailers pay to a postal operator in the country of destination to cover costs for shipping a package. Efforts to push for self-determination of rates were not well received at the Ethiopia meeting, a senior White House official said, and the administration will now begin a regulatory process to accomplish that on its own outside of the UPU. Officials said they expected the U.S. government to start setting its own rates for small packages within the next six months to one year. They argued the current set up is causing economic “distortion,” as the Postal Service is ultimately subsidizing foreign mailers. The agency praised Trump’s move. Robert Taub, the chairman of that commission, said the PRC has for two decades raised concerns about the terminal dues issue. He explained that it has come more to the forefront as e-commerce has expanded. Withdrawing from the UPU, if the administration follows through on that action, could have its drawbacks. The agency is the platform by which postal entities throughout the world settle all types of mailing issues. The Trump and Obama administrations, for example, used the UPU to negotiate changes to shipping standards as part of their efforts to root out illicit substances arriving in the country through the Postal Service. The U.S. government has in particular pushed for “advanced electronic data” that enables Customs and Border Protection officers to better screen for material such as synthetic opioids like fentanyl, which has increasingly slipped into the country through the mail in recent years. 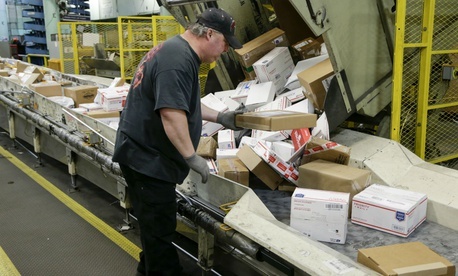 A recent USPS inspector general report found that 92 percent of websites offering illicit items on the “dark web” advertised that they shipped using the U.S. Postal Service due to its more relaxed standards. “We would prefer to stay within the UPU,” a senior White House official said, noting, “It does provide some benefits.” The official added the UPU assists with the war on illicit drug trafficking, and the administration is working to maintain its access to advance electronic data whether or not it withdraws from the organization. The current system also eases the process by which foreign enterprises can send counterfeit materials and has cost American jobs, the officials said. They added the subsidies cost the American economy $300 million annually.